While you might not be able to swing a trip across the Atlantic this weekend, you can do the next best thing: make a dinner reservation. From rustic trattorias lined with bottles of Tuscan wine to cozy French bistros wafting with the smells of garlic and butter, here’s where to pretend you’re in Europe without leaving the city. If this Italian restaurant feels reminiscent of a Tuscan farmhouse, it might have something to do with the fact that the owner’s family owns a restaurant just outside Florence. 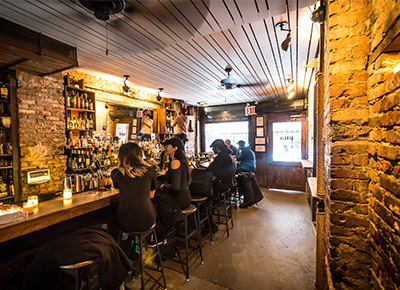 Both the original East Village location and its newest offshoot in the West Village serve comforting and delicious antipasti and homemade pasta dishes in a rustic space that lends itself to lingering. You’ll find dishes like pappa al pomodoro (a hearty bread and tomato soup), paper-thin prosciutto and fat hand-cut noodles tossed in slow-cooked duck ragù. We also love the rotating selection of Italian wines, displayed in a basket and available by the glass or bottle. You’ll actually find a spin-off of this Greenwich Village bistro in Paris’s Pigalle neighbourhood, but you’ll get plenty of French ambience right here, with pressed-tin ceilings, exposed brick and wine bottles galore. The small dinner menu features French classics like steak tartare and oysters, but we prefer the brunch offerings, which include some of the fluffiest scrambled eggs we’ve ever had, topped with smoked salmon and crème fraîche or prosciutto. This tiny bar off Irving Place—the slightly more affordable sister restaurant to Michelin-starred Casa Mono—is perhaps the closest you’ll get to Spain by way of Manhattan. Inside are just a few communal tables with bar stools, but it’s cozy, inviting and unpretentious. Our favorite part is the extensive Spanish wine list featuring bottles from Catalonia to Mallorca and everywhere in between. This Nolita mainstay is quintessential New York, while somehow also maintaining a distinctly French-Moroccan vibe. Look for North African flavors in dishes like baked eggs in tomato sauce with merguez sausage and couscous with eggplant, pine nuts and hummus. On a warm spring day, you’ll find the sidewalk seats filled with stylish diners sipping espressos and eating the famous avocado toast speckled with chili flakes and lemon juice. Where Chinatown meets the Lower East Side, you’ll find this unassuming Mediterannean-inspired wine bar. Most of the menu here is seafood, and true to Spanish and Portuguese tradition, it’s prepared simply: grilled and tossed in olive oil, garlic and a drizzle of lemon. The manila clams in vinho verde and the grilled Louisiana white prawns are menu favorites, and make sure to order a side of the house-baked sourdough to sop up all the garlicky broth. Kafana, with its forest-green awning and low-lit interior, is one of the only places to eat Serbian cuisine in NYC. Inside, the exposed brick walls are decorated with vintage postcards and tchotchkes from Belgrade. If you’re a stranger to Slavic food, expect a meat-centric menu with dishes like braised lamb shank, chicken kebabs and pork sausage. For something vegetarian, don’t miss the flatbread-like toast, stuffed with a creamy cheese similar to ricotta. Expect to find a wait at this pocket-sized West Village café just about any time of day. Located on treelined 11th Street, Tartine looks as if it might belong in Paris’s picture-perfect Marais neighborhood. The food is no-frills yet satisfying (think smoked-salmon eggs Benedict for brunch and moules marinieres at dinnertime). If the weather is nice, snag one of the few outdoor tables, and don’t forget to bring a bottle of Burgundy—this spot gets major bonus points for its BYOB policy. Astoria has no shortage of excellent Greek restaurants to choose from, but Taverna Kyclades is perpetually packed for a reason. It’s not just the food—which tastes like it was home cooked by a grandmother in Santorini—but also the friendly atmosphere that keeps us coming back. While we haven’t eaten anything here that we wouldn’t order again, the seafood always steals the show. Don’t miss the very generous portion of charred octopus and the flaky branzino fillet, and don’t sleep on the horiatiki, quite possibly the freshest Greek salad we’ve ever tasted. This upscale deli looks like it was plucked right from Madrid and placed in Nolita. Walk in and you’ll be greeted by a huge selection of Spanish cheeses, meats, canned seafood and Castellaolives. Toward the back, there’s a tapas bar where you can order from a menu of bocadillos, pintxos, croquettes and more. Pro tip: Despaña also owns an adorable Spanish wine shop next door where you can buy a bottle of Rioja or txakoli to pair with your tapas. Blink and you might miss this tiny family-run Italian restaurant. Inside there are about five tables and a narrow kitchen that dishes out comforting Italian classics like decadent lobster ravioli in cream sauce, airy pillows of pesto gnocchi and crispy chicken Parmesan. Best of all, this cozy spot is BYOB, so make sure to pick up a bottle of your favorite Brunello. Tucked away on Orchard Street, this unassuming restaurant feels (and tastes) like a bit of Central Europe on the Lower East Side. If you’ve never tried Austrian food, this is the place to dig into plates of cheesy spaetzle noodles topped with Gruyère and caramelized onions, Wiener schnitzeland sausage with sauerkraut. The drink list boasts a half dozen rare imported beers as well as Austrian wines like Blaufränkisch and Grüner Veltliner.